I have previously written about the fact that the heat in the ocean isn’t there. A Facebook commentator produced some excellent graphs based on the ARGO data which showed NO heat accumulation at any level in the world’s oceans. This lack of warming contradicts completely (Anthropogenic Global Warming) AGW theory as put forward by such AGW stalwarts as Trenberth and England. It also has Hansen scrambling for weird and whacky explanations. So it is plain in the ARGO era that the oceans are not warming and this contradicts AGW. In my articles I noted that NODC graphs were shown in joules which allowed a steeper slope compared to a temperature trend. Mischievously I suggested an ulterior motive for this. Alarmism. Well to me the trend slope in the joules graph looks steeper and more alarming than the temperature graph. But Rob doesn’t like OHC as a measure of the energy; it is poor terminology according to Rob. Hey Rob, don’t blame me, argue with NODC and indeed AGW in general; they’re the ones using and relying on it. 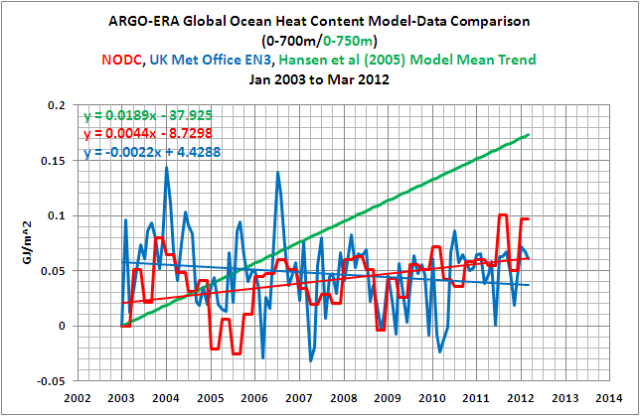 Plainly Hansen’s model on behalf of AGW is off with the pixies while the MET and the NODC show the opposite trend! At the 700 meters range NODC have increased the trend by 19%. The NODC adjustments increase the trend at 2000 meters by 36%! The sampling of the oceans is by no means as uniform as I had expected. Part of the ocean is under sampled, sometimes badly so, compared to other areas. Half of the global ocean has been sampled less than 20 times per 10,000 sq. km, and 14% has never been sampled by Argo floats at all. Even when we look at just the area from 60°N/S, half the ocean has been sampled less than 24 times per 10,000 sq. km, and 8% is unsampled. The area of the El Nino phenomenon is a critical area for the regulation of planetary heat loss. 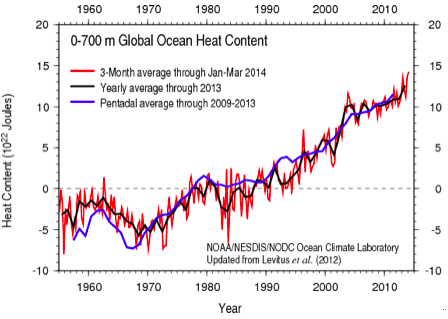 Oceanic heat content in this area can change quite rapidly. However, parts of it are woefully undersampled. Finally, the older Argo floats sample either down to 1,000 metres, and intermittently go to 1,500 metres depth. The newer ones go down to 1800 metres. Which is quite deep, about a mile down. But the estimates of oceanic heat storage include the whole ocean. Figure 3 shows a pair of transects from Antarctica (on the left) to Hawaii, and then Hawaii to Alaska on the right, to give some sense of scale. The Argo floats operate mostly in the warmer area up top of Figure 3, above the lower thermocline (light blue). Average depth in this entire transect is much deeper than that, about 5,000 metres. So the Argo floats are measuring less than a quarter of the water in this part of the Pacific basin. Makes the whole question of oceanic heat content kinda iffy. Kinda iffy is a vast understatement! The ARGO floats don’t even go to 2000 meters and yet we have temperature profiles at that depth. 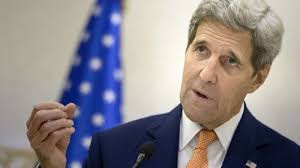 The only reasonable conclusion is that based on the best data from ARGO the oceans are not warming, whether you are considering joules or temperature. Thanks again Rob; by my reckoning that is another nail in the AGW coffin. Here we go (I have done this before on the Scientific American bulletin boeard and they predicatbly did not understand and then called me names). You don't get it. It is not energy of the ocean that heats the atmosphere, it is the TEMPERATURE change. Even if the ocean were infinite, and warmed 0.066 K, the most this could raise the atmospheric temperature is 0.066 K. You are looking at apples and oranges when you look at accumulated energy vs temperature. You are incorrect. The energy required to generate the missing heat (difference between models and the measurements) is around 1/17th of the amount required to heat the ocean the amount that has been claimed in the literature. 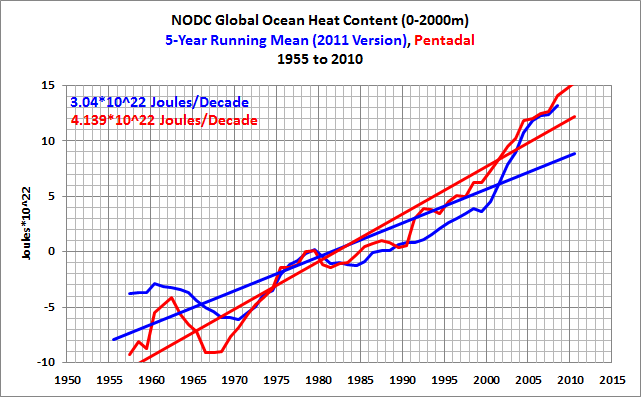 Therefore, there is a logical break in the argument that the ocean temperature rise is due to AGW alone. In fact the energy required to account for the 'missing' heat would be able to increase the temperature in the top 700 meters of the ocean about 0.0039 deg K (same as C). I do not think that you are considering specific heat. The heat transfer is not 1:1 between the ocean and air because the specific heat of the ocean water is about 3 times higher than that of the air. This is why it gets hot during the day over water but the water does not get as hot (think swimming in a lake in the farther northern latitudes). FYI: the accumulated energy is a measure of how much energy it would take to raise the temperature of the ocean as indicated by the data presented. The only way to raise the temperature of anything is to apply the energy. So, the accumulated energy has been computed back from the data and when you compare that to the amount of energy required to account for the missing heat in the atmosphere you find that they are not equal and therefore there must be something else at work warming the oceans (some might postulate cooling lava at mid ocean ridges might be helping, or x number of other processes). The simple version is that AGW is not alone responsible for the warming of the oceans ... the energy balance does not work out. A good point Leonard. Of course other things heat the atmosphere other than the ocean, but the most the ocean can heat the atmosphere is the extent the ocean has warmed. Anonymous - I briefly scanned your little argument. I reached the point where you claim that "the average ocean depth is 4267m so the top 700 meters is about 16% of the volume". I actually choked a sip of wine out of my nose from laughing. I couldn't risk scanning any further. You clearly think of yourself as mathematically inclined... but you don't understand that the outer 15% of a SPHERE (by depth) is not 16% of the volume of a SPHERE. Get it? VOLUME? SPHERE? Radius CUBED? Just of the top of my head, the outer 16% of a sphere accounts for something in excess of 40% of the total volume of the sphere. You can make whatever adjustments you wish (warmists always do), but you will never get it down anywhere near the ignorant 16% figure that you tossed out. Still having trouble understanding what I'm saying? Still think the mean skeptics are just calling you names? Here's an example that you might understand. A 10-inch pizza has an area of about 78.5 sq in. Increase it by 20% (a 12-inch pizza) and the area goes up to about 113 sq in. The area didn't increase by 20%, but by 44%. The same applies to a sphere, only worse. The outer 16% of a circle contains about 29% of the its area. Likewise, the outer 16% of a sphere contains about 40% of its volume. And your brain contains about 40% of the reasoning ability of a high school sophomore. It's a math thing... you wouldn't understand. Anonymous#2, you owe Anonymous#1 an apology, because he is correct about his ocean volume calculation and you are wrong. Your error comes from the fact that we are not talking about the outer 16% of a sphere, we are talking about the outer 16% of a thin layer on the surface of the sphere. 2) that the diameter of the Earth is 12,742,000m, giving a radius of 6,371,000m. Therefore the radius of the ocean's surface is 6,371,000m. The radius of the 700m depth is 6,370,300m. The radius of the ocean bottom is 6,366,733m. 16.405% is for all practical purposes the same as 16.414%, so we see that Anonymous#1 was correct, and you were wrong. And not wrong by just a little bit, but your 40% "of the top of your head" was wrong by a HUGE amount. Obviously you didn't get 40% off the top of your head, you got it out of your other end. From your condescending attitude and ridicule, you clearly think of yourself as mathematically inclined... but you demonstrated that you don't understand that the percentage of a thin skin on the outer surface of a sphere is different than the percentage of the whole sphere, and when the outer skin thickness is very very small compared to the radius of the sphere (700/6,371,000 = 0.00011), the spherical effect essentially vanishes. Therefore we see that you were projecting when you accused Anon#1's brain containing about 40% of the reasoning ability of a high school sophomore. Indeed it IS a math thing ... a thing that you don't understand. Perhaps it was too much wine that caused your sophomoric blunder. In the future you would do well to DO THE MATH first to avoid embarrassing yourself. Agreed. I basically assumed that the ocean was a swimming pool and knew that I was going to be slightly off on the 16% which is really 16.414 (see above). Also, I happen not to be a 'warmist' so I suspect that you did not understand my post. I firmly believe that a comprehensive analysis of the data is the only way to determine the most reasonable answer. This is what I have done and I have found a MAJOR bust in the energy balance. 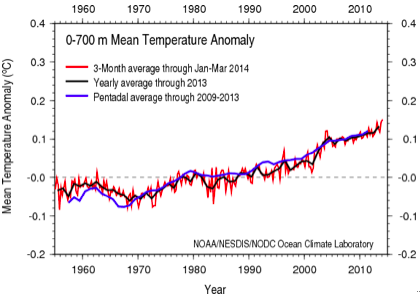 Any significant change in ocean temp would increase its volume. Note that saline (sea) water has uniform density gradients all the way down to below 0°C. Thanks Brian; as I understand it; sea level is determined by 3 factors; eustatic or the total mass of water which is impacted by [alleged] melting of sheet ice at Greenland and Antarctica predominantly; steric or thermal properties when the temperature of the water changes; and isostatic or localised land movements. 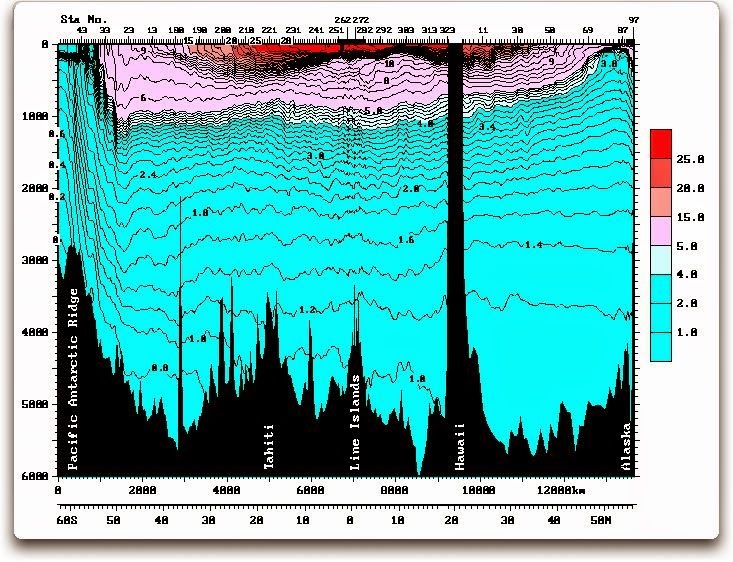 Could you elaborate on your point about "uniform energy gradients"? 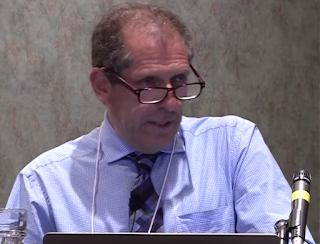 "Any significant change in ocean temp would increase its volume " You seem to be of the same school as NASA bloke, Josh Willis; who states " water volume increases with temperature"
If you heat water from 0.1 deg. 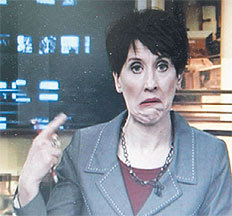 C to 8.0 deg C, there is no change in the volume. The volume declines to 4 deg C , then starts expanding.The average temp. of the Oceans is given as 3.8 deg C, so if the Oceans are expanding, they must be losing heat.